At Simon Wellness our multidisciplinary team understands about living with any kind of pain can be exhausting, both physically and mentally. If you are a patient with acute or chronic pain and you have not responded to conventional therapies, we have over 30 years of experience and expertise to diagnose, treat, and help manage your pain. Our multidisciplinary pain manage team includes specialists from chiropractic, acupuncture, massage, naturopathic medicine. Simon Wellness is conveniently located on the 3rd Floor of 697 Cambridge Street, Suite 303. Our state-of-the-art facility features comfortable exam rooms, fully equipped procedure rooms and a friendly and caring support staff. Dr. Simon has a passion for leading a healthy energetic lifestyle and is an avid runner and cyclist with a strong interest in nutrient and sports performance. "I have tried many diet programs without much success. The ideal Protein Diet works! I have lost 28 lbs. and am down to a size 10. Yahoo! Susan has been the key to my success. She is an excellent coach. She provides encouragement, support and direction. She has given me many recipes and tips. Her pleasant manner and enthusiasm helped keep me inspired during this weight loss program. I highly recommend this Ideal Protein location for anyone that is serious about once and for all losing those extra pounds." "Dr. Simon is the chiropractor I most trust in Boston area. He is a brilliant Doctor who has continued to learn his craft year after year, keep up with any advances in technology, refine and perfect what he offers. 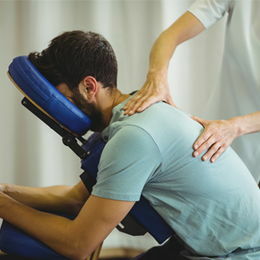 His adjustments always get to the core of any issues, help me through injuries ans have been a huge part of alleviating my migraines over the years. I have worked with and been to many chiropractors and never found another one as competent or consistently effective. I highly recommend this man's work. He also always has great aftercare recommendations and will point clients in the right direction for their own health needs." "I was a patient of Dr. Simon's for a year, originally seeking immediate treatment after breaking my leg and stretching ligaments in my ankle due to a fall. This resulted in overcompensation on my "healthy leg" and caused all sorts of lower back and hip pain. I was very pleased with Dr. Simon's approach which included a variety of different methods. He was always willing to listen to whatever was bothering me on a particular visit and figure out what worked best for each situation. All around a thumbs up for his technical abilities, easy going personality and encouragement to get me through a tough situation. In addition, it;'s a great office with a friendly, professional staff and has parking. Check them out!" "I went to Dr. Simon with an IT Band injury (a ligament) that was so severe. I couldn't walk for more than 100 yards before my knee popped (reminiscent of "trick knee"). I don't normally go to chiropractors, but I was willing to try anything, specifically Active Release Therapy (ART) a treatment of the myofascia. Dr. Simon utilized this technique and others. Much to my shock, I was running within 10 days. Miles. I am now back to 16 to 20 miles on my long runs and on my way to the Honolulu Marathon, within 3 weeks. I have a PhD in Physics (not a joke or an exaggeration). This guy is not a quack, as I typically assumed for chiropractors given previous experiences and provides real healing. If 10/5 stars were available, I would push for that. He hasn't tried to sell me anything and went right to work providing treatment and sport chiropractic care. I was never a believer before. I am now. Go for it"
"Been going to Dr. Simon for 5 years now. He is the best of the best. I would change PCP's all day long, but I would never change my chiropractor. Efficient and friendly office."